The qualification aims to provide learners with the understanding and practical skills needed to work as a Personal Trainer in a variety of settings. This includes understanding health and safety in a fitness environment, customer service, anatomy and physiology, personal training programmes and sessions and nutrition. Learners must have the Level 2 Certificate in Fitness Instructing before enroling onto this course. Learners successfully completing this qualification will be able to gain access to the Register of Exercise Professionals (REPs) at level 3. 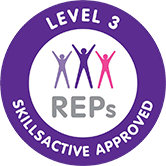 Learners successfully completing this qualification will be able to gain access to the Register of Exercise Professionals (REPs) at level 3. The requirement for learners to complete 4 mandatory units ensures they gain an in depth understanding of personal training. Learners will have the opportunity to develop their theoretical knowledge of the subject as well as developing their practical skills. Learners will develop their understanding of the values and principles which underpin all work in this sector, eg working with clients, health and safety within the fitness sector, team working skills, reflective learning, self discipline, having a positive and cooperative attitude, self assessment of strengths and weaknesses, self improvement and development. Can I come to a training day? FitLearn hosts training days every month for our students. We have a state-of-the-art training venue in Suffolk. These can be booked with your student portal and offer some great tuition from our expert course tutors. Training days are completely optional and therefore we charge £150. Please remember that this is a completely optional extra! All awarding bodies charge registration and certification fees. At present the Level 3 Certificate in Personal Training is £90. These are regulated qualifcations* and are also endorsed by REPs and CIMSPA meaning you can join both REPs at Level 3 and CIMSPA and gain access to other benefits such as discounted insurance.